There are always ways to erase stuck stress in your life . . . When I’m awake for over 24 hours, traveling for roughly 12 hours, I shower in MY own shower, I order take out, I do a MELT map to rebalance my exhausted nervous system, a bit of upper body length to undo the crazy neck positions I found myself in as I attempted to rest on the plane, and some lower body hydration to erase those sad airplane seats! Cheers to traveling and the sweetness of being HOME!! Day 31 of ‪#‎flowittogether‬ , awe it’s the last day! It’s supposed to be the flow sequences from weeks 1-4, but after an exhausting trip traveling home from Cali, this is how I listen to my jet lagged body and nervous system. A bit of a restorative flow including the concepts of some of the twists, forward bends, and hip openers from this amazing challenge! I hope you all don’t mind my complete restorative interpretation of the flows 1-4 . . . 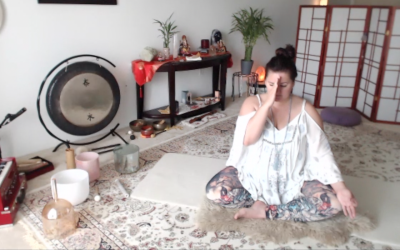 This challenge was inspiring, truly opening to not only the flow of my asana practice, but how I flow in and out of my days and ever changing life! Yoga is so much more than just the beautiful art of the physical practice, it is truly a practice to find balance and serenity in all aspects of one’s life. Thank you to the hosts and sponsors for an incredibly creative challenge, it was so fun putting together the flows! Om Namah Shivaya! Love and Light! “Better indeed is knowledge than mechanical practice. Better than knowledge is meditation. But better still is surrender of attachment to results, because there follows immediate peace.“ Bhagavad Gita.